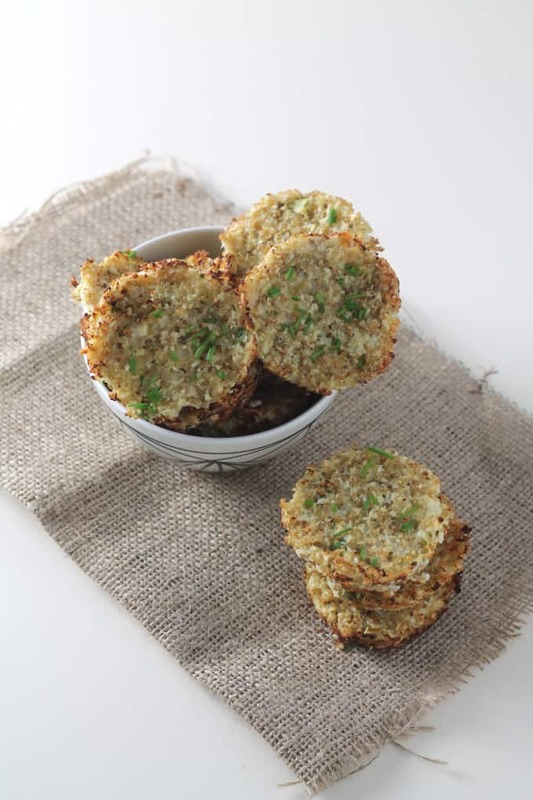 These delicious Cauliflower Cheese Quinoa Bites make an easy and healthy savoury snack! It’s the first Monday after Christmas and New Year and it seems like the whole world is back on the healthy eating wagon. My jeans are definitely a lot tighter after the festivities and the kids have eaten their weight in chocolate. It’s time to fill the house with unprocessed whole foods again! 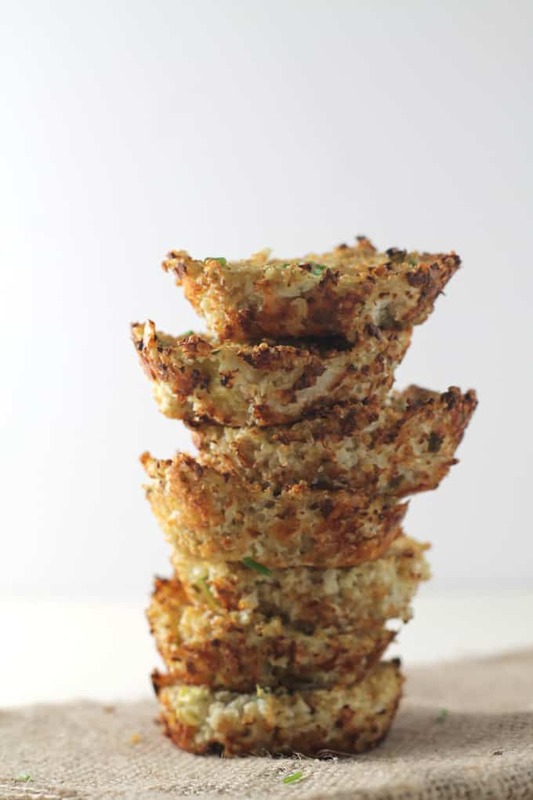 So today I am starting as I mean to go on with these super healthy Cauliflower Cheese Quinoa Bites. Tasty and filling these super little bites of goodness make the perfect afternoon snack for adults and kids alike. Quinoa is a “complete” protein source, meaning that it provides the majority of the essential amino acids our bodies need. 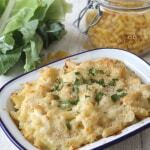 It is also an excellent source of fibre and iron and is gluten free. The combination of protein from the quinoa and eggs and fat from the cheese will satisfy even the hungriest of kids, keeping them full until dinnertime. 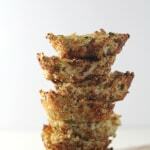 In my recipe I blitz the cauliflower in the food processor for two reasons. 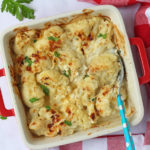 Firstly, it breaks the cauliflower down into tiny little pieces meaning it doesn’t have to be cooked before baking the bites in the oven, saving time and energy. Secondly, large chunks of cauliflower can often be off-putting to little taste buds. Your kids may not even realise there is any cauliflower in these snacks! 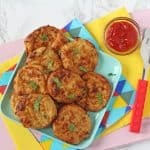 I made these bites using a 12 hole cupcake tray but if you fancy making them more substantial and eating them as part of a main meal, then they would work well in muffin cases too. Chop the cauliflower into small pieces and place in a food processor. Blitz until the cauliflower reaches a rice like consistency. Alternatively you can grate the cauliflower to achieve the same result. Place the cauliflower rice in a bowl with all the other ingredients and mix well with a spoon. Spray a little oil or rub a little butter into each hole of a 12 hole cupcake tray. Place a large spoonful of the mixture into each hole, flatten down and bake in the oven for 15 minutes. 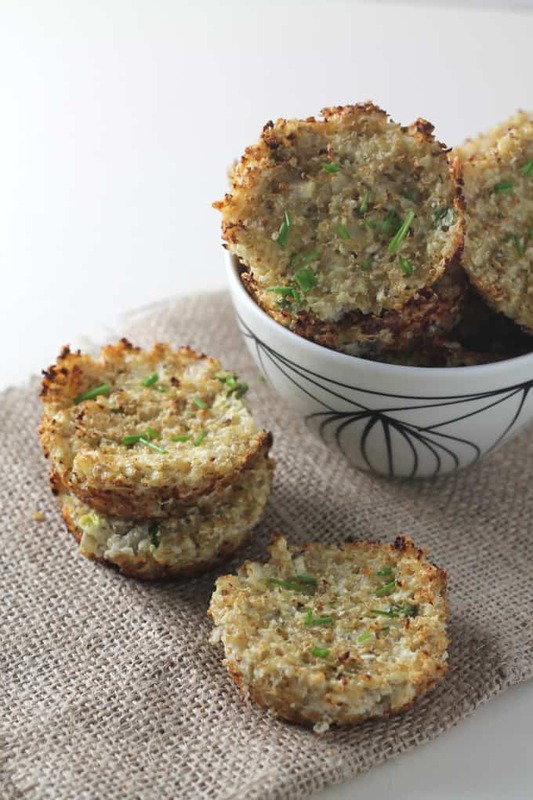 Allow the quinoa bites to cool a little and firm up before you attempt to remove them from the tray. my baby loved these but they were super crumbly and made such a mess. Any tips for making them less crumbly next time? I was really surprised my little one ate these but he really enjoyed them. Will be making these a lot I think! Hi Sarah, I haven’t tried to freeze them myself but I don’t see why not! Great, thanks…I’ll let you know so!! That’s great to know, thanks for coming back and sharing! Hi Cyn. No, its quinoa cooked and then measured as 1 cup. So that’s probably about 1/2 cup of uncooked quinoa but I don’t know the measurements exactly. Hi Galina, yes I’m sure it would work just as well with goats cheese. What kind of cheese dud you use? How large was your 1/2 head of cauliflower? Was it about twice as much cauliflower as quinoa or equal amounts? The cauliflower I bought at the farmers market last week was huge… it was easily 10 inches diameter. That sounds huge Debbie!! I had about twice as much cauliflower to cooked quinoa! Whoops! Thanks for letting me know! Thanks Mandy. Hope you enjoy them! Thanks Vicki. Hope you enjoy them. Even the baby ate them here!